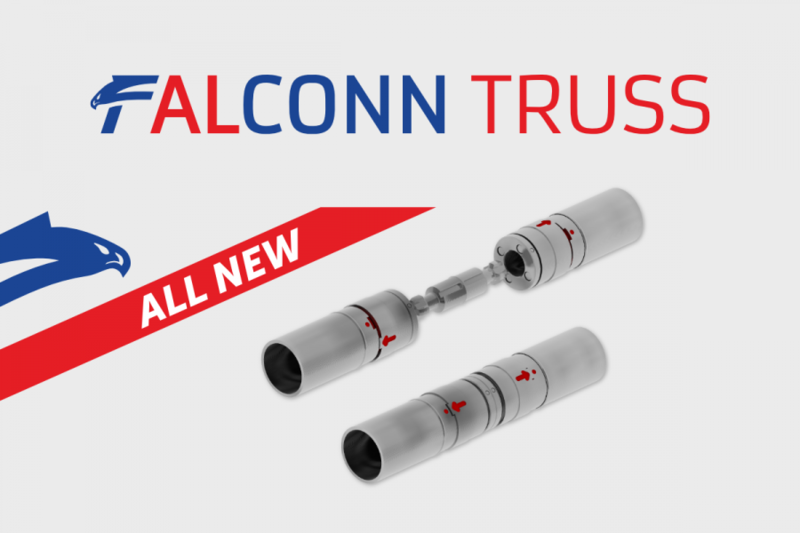 FALCONN connection finally reveals itself to the world. The innovation that brings entirely new approach to connection between two trusses. Check the link to see how it works. FN24 series incorporates the FALCONN connection into the 220x220mm / 8x8inch trusses, however, this is the first step and we plan to work on its application also into the standard truss series of FT34 (290x290mm / 12x12inch). The FALCONN connection itself is based on a simple locking system that does not require usage of hammers and safety pins. There are two safety rings at each connection. First one locks the connector in position and the second one secures the connection. This double locking system ensures proper strength and safety of the connection part. It is silent while building up or breaking down and the only thing you need to make the connection work is the FALCONN connector and your hands. There are no other connecting accessories needed. Take a look into our gallery to see the connection described step by step in pictures.